Gridskipper said: “For over 80 years, Marga Schoeller has maintained a standard of excellence. The elegant shop is divided between English- and German-language books, the former neatly situated in a cozy alcove. It carries first-rate selections of poetry, theater, fiction, and nonfiction in abundance, and its proximity to Ku'Damm is ideal for closing a full day's shopping spree. What better way to unwind than in the surrounding of books? Employees are friendly and generous and will happily order a book at your request." The carefully selected English section of this store covers mostly fiction, but feminist and anti-racist literature, philosophy, biographies and numerous academic works from all fields are also to be found. The store is also known for its well-stocked theater and cinema section. Marga Schoeller bookstore was once listed among Europe’s ten best bookstores and it still maintains a very high standard. From time to time, free coffee and sometimes even cakes are served to customers. Well-read and ready to help staff can be taken for granted at this store. The tradition of English books in this well-established Berlin bookstore dates all the way back to post war years. Marga Schoeller refused to sell Nazi literature in the decade preceding World War II and once the war was over, she was given the license to sell English books by the allies. 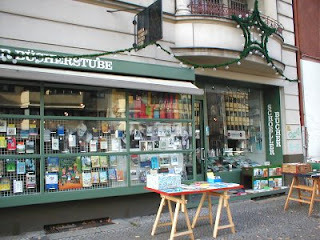 During the Cold war, the bookstore earned the reputation of West Berlin’s main literary institution. During this period some great literary figures visited the store or belonged to its clientele – names like, Samuel Beckett, Hermann Hesse, Thomas Mann, T. S. Eliot, W. H. Auden, or Thornton Wilder speak for themselves. In 1974, the store moved from its original location in Ku’damm just several hundred meters away to Knesebeckstraße.